Dogs Caught in the Act! "This is Otto. He is a ten-month-old Rat Terrier. We keep him in the bathroom during the day even though our other Rat Terrier, Roxy is not confined. He will soon graduate to free range as well because he has been doing very well when we are not home (except when I leave the toilet paper within his reach!)" Sanford, a 4-month-old Lab—"Sanford's newest trick is eating our house! He tried to blame it on the other three dogs but we know it was our darling Sanford." Dublin the Golden Sheltie (Golden Retriever / Shetland Sheepdog hybrid) CAUGHT! Moxi the Chihuahua Terrier mix at about 2½ years old. Her owner states, "She was left in our front yard under our bushes when she weighed only 3 lbs. Apparently someone didn't realize the love they were about to miss out on!!! These pictures are of her pulling the stuffing out of an animal we had just gotten her. It took her all of 3 minutes to pull all the stuffing out." "Needless to say, stuffed animals don't last long in this household." Showing evidence of the shred-fest she had! "What??!! What did I do??!!" Moxie trying to go for more, after the mess had been picked up. Gotta love her!!! Bear and Koko, two Boston Terrier puppies wait until their breeder walks away after cleaning their pen to redecorate. This is after about five minutes of roughhousing! Bred by Lucky J Bostons. Teri the Whoodle at about 3 years old. "Teri has a habit of stealing my mother’s knee-high stockings out of drawers or even off her feet as she's taking them off! Here we caught her with one after she had stolen it." 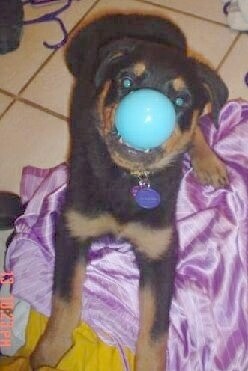 This is Piper (German Rottweiler) at 4 months old. "When I came back into the room from putting my daughter to bed, I found that she had pulled clothes out of the hamper and was playing with/chewing on half of a plastic Easter egg and got it stuck on her nose!" Buddy the 3-month-old Chonzer puppy had some fun with the toilet paper! Why does my dog do that? Learn what makes a dog tick and what you can do to turn your dog into a happy, well behaved, respectful canine. Do you have a photo of your pet caught in the act of a no-no? Send it in!